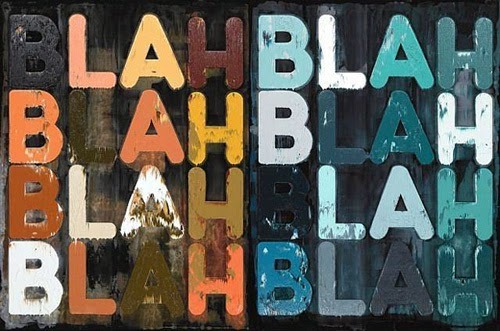 Mel Bochner "Blah, Blah, Blah"
And if you eat it, it will kill you? That has us slowly dying of this 'nothing' called boredom. Boredom, like the answer to the above riddle, also contains seven letters and two syllables, but sounds royal like the word kingdom, a place where we too could be the rulers of our own boring worlds. Only it's 'dumb', the homonym of the suffix 'dom', to believe any of us have control of our lives, or world, when bored. One minute we're movin' and a-groovin' to the beat, and the next, we're a metaphor, a boat, afloat, without the velocity to propel forward. Overnight, clear skies turn to fog, and the clarity of our thoughts, energy, desire, and all meaning are gone. All we can do is wait... wait for the clouds to lift. Us, we... I use these personal pronouns loosely. Grammar aside... I'm bored and hopefully you're not. It's not a permanent condition, just feels that way... eternally lost in search of something interesting to do. And it was in those moments of nothing happening that I'd stand inside our tiny ranch home on Long Island, as a kid, and sigh out loud, "I'm bored." Occasionally interjecting the word 'mom' into the mix, as in... "Mom I'm bored", "Mom I'm bored", "Mom I'm bored" like a broken record. Then I'd shuffle off to my room, lay on the bed, and listen to music... records on a record player with a skate key taped to the arm of the needle to keep it from skating across the grooves of the vinyl... a literal but creative solution. I was full of ideas, as now, only then I was the one friends came to whenever they got bored. But like some professionals, the house painter whose own home looks shabby, or the auto mechanic who drives a clunker, I was, and still am, the motivator who sometimes, when alone, can't get moving. At twenty-three, I moved from Pennsylvania to California with my boyfriend, now husband, where I put in twelve-hour days teaching nursery school and traveling between San Francisco and Berkeley while Michael got his Masters from the Art Institute. On weekends, with energy depleted, I'd stare into space and drag about the studio with the bottom of my lime green terry cloth robe flipped over my head. I was a zombie in a hoodie. It didn't matter that I had a camera, a darkroom, and a colorful city with near perfect weather to explore. I was bored. Bored then and now... only now I have some energy, but the weather here in Philadelphia is far from perfect. January arrived but winter came early. November brought the snow and frigid temps that linger, and it's this constant effort to stay warm, too much time indoors, and fighting the clock before dark that has me feeling unsettled. "Pay close attention to the most tedious thing you can find (tax returns, televised golf) and, in waves, a boredom like you've never known will wash over you and just about kill you. Ride these out, and it's like stepping from black and white into color. Like water after days in the desert. Instant bliss in every atom." So I'm riding it out. 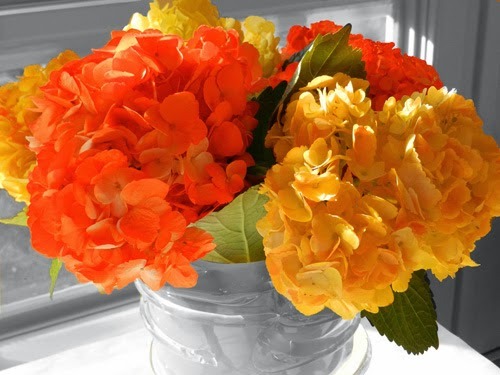 I bought flowers, hydrangeas dyed neon orange and yellow, to shock my senses and replicate the effects of an actual sun. I'm paying attention to the ordinary in hopes of finding the extraordinary: condensation forming on a window, shadows flickering on a wall, paper fluttering on a cardboard roll. And I'm looking to others for motivation, those who manage to create rather than wait for inspiration to rise above boredom. Artists like Nina Katchadourian and her project 'Seat Assignment', "born from an investment in thinking on your feet, from optimism about the artistic potential that lurks within the mundane, and from the curiosity about the productive tension between freedom and constraint." 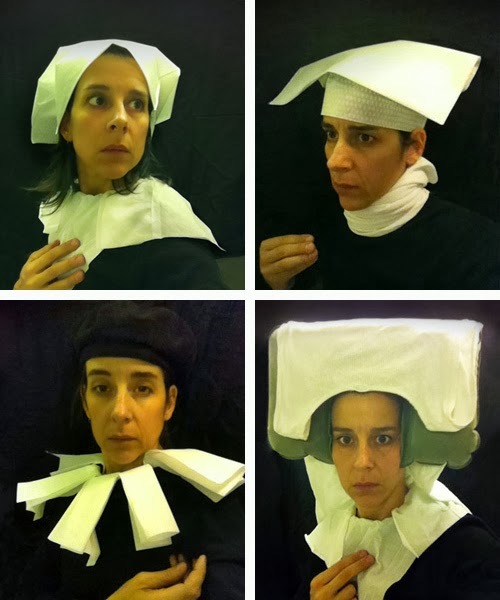 Her 'Lavatory Self-Portraits in the Flemish Style', a series from 'Seat Assignment' 2010 and ongoing, was created while on a 14-hour flight from San Francisco to Auckland using only the lavatory's own lighting, materials close at hand, and a camera phone. Anything but boring!... a reference to the artwork but a grammatical error, a fragment, lacking a subject and verb. Good grammar is essential, keeps everyone on the same page. The abstract becomes concrete and the chaos becomes ordered. But writing correctly isn't easy; the rules are confusing. I hardly know when to use 'me or my', 'lay or lie' commas or no commas. I question my tenses, if my participles are dangling, and is punctuation placed inside or outside of quotations? I rarely use semi-colons; (parentheses) or the em—dash. My favorite punctuation mark, as you can tell from my overuse of it, is the ellipsis... 3 dots. Besides being partial to things that come in 3's, like a beginning, middle, and an end, ellipses allow me to ramble a bit, interjecting and connecting thoughts without appearing to be the queen of the 'run on sentence'. "A run on sentence walks into a bar it was thirsty." Perhaps a difficult joke to get at first, but putting punctuation where it's needed between the words 'bar' & 'it', would just kill the punch line. Q: "Why did the comma break up with the exclamation point?" A: "It was always yelling!" Q: "What's a prisoner's favorite punctuation mark?" A: "A period. It marks the end of his sentence." Q: "What's spaghetti's favorite punctuation?" "The past, the present, and the future walk into a bar. It was tense!" I can almost sense the boredom lifting. Boredom... how do you handle it? What's your take on grammar? 7 Tips To Fight Boredom here. Silly Things To Do When Bored here. An Interesting History of Boredom here. A Discovery About Boredom here. What Your Favorite Punctuation Mark Says About You here. Writer's Favorite Punctuation Marks here. 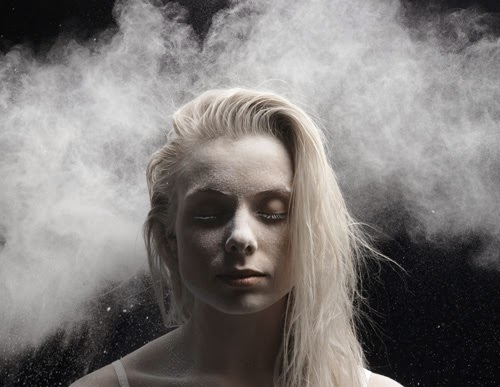 Henrik Sorensen: 'Smoke, Dust, and Dancers' here. Nina Katchadourian: 'Seat Assignment' Photos here. Sakir Gokcebag: Art With Toilet Paper here. Listen and watch The Beatles sing Ob-La-Di, Ob-La-Da here. Denisee P... Thanks for being my muse on this 'HERE and NEXT' post. Your mindfulness of boredom's tedium comes shining through in this blog. How wise it is to be present to it-- just being aware of yourself, when face to face with such an unpleasant guest. Just be sure you breathe, focusing on the inhalation and exhalation....Boredom does seem to be in that family of dullness, tiresome, weariness, nothingness and their dancing partners-- excitement, energized, motivation, and somethingness. What odd couples on the dance floor of our lives. Syntax does make boredom come to life---rescuing it from the lonely, non-copassionate realm of -- " If only I were more disciplined, original, motivated, __, __, __." (fill in the blank). As you can proabably guess, syntax is my favorite part of grammar. 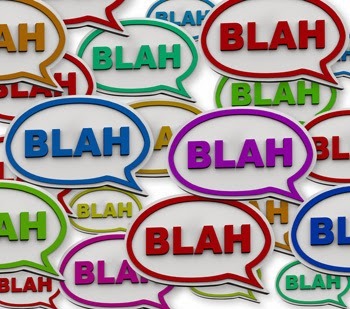 As for my favorite punctuation marks, give me a good comma,,,,,,,,,,,,dash-----------------, or parentheses ((((((((---))))))) and I'm in happy, linguistic, heaven. First, I must comment that I had no idea what you did when you lived in Caifornia. Maybe I knew at the time but forgot after all these years. One of the things I love about reading your blogs is that I get to know more about you. Second, I love the gorgeous hydrangeas. Such beautiful, vibrant colors! The "Lavatory Self Portraits in Flemish Style" were a hoot. Did she really do them all on an airplane? Enjoyed the toilet paper rolls on the wall. Who would ever think that such beautiful designs could be made with such a lowly, mundane object as a roll of toilet paper? I saw this on a poster: Let's eat Grandma! My favorite punctuation marks seem to be commas (they save lives, after all!) and parenthesis. I tend to use both frequently. I've never quite figured out how to use the semi colon in sentences except to separate items in a list. My feelings about grammar are that it is incredibly boring and yet very complicated at the same time. There are a few tricky rules that I'm not sure about. I hate it though, when I hear people speak improper English. For example if someone says, "I seen her yesterday." I'm afraid that I couldn't tell you what an infinitive verb is or a transitive verb or exactly what a dangling participle is but I know when it sounds right. I remember having to diagram sentences in school.....hated it! My favorite strategy to combat boredom when waiting at an appointment or during a lull in an activity is to read. I try to always bring a magazine or book with me. I love Reader's Digest for that purpose. When I am doing a boring task such as folding laundry, I think about other things. My favorite subject to think about these days is my little Parker. I recall his precious face and the cute and funny things he does. If it's a sunny day, I enjoy looking out the window. When I'm really bored it's because I have things to do that I really don't want to do. In which case I go check my email or do some other avoidance tactic. A nap is good too.